Walt Disney's original 1953 Disneyland map. SHERMAN OAKS, California (WABC) -- Van Eaton Galleries, one of the world's premier animation and Disneyana auction houses, has announced the re-discovery of one of the most important drawings in Disneyland history. The artifact will be auctioned at the gallery in Sherman Oaks, California, and is expected to fetch $750,000 to $1 million, making it the most valuable Disney artifact ever offered at an auction. The gallery said the map was created by Walt Disney himself when the park was in the early stages of creation, and it was crucial in obtaining the finances Walt and his brother Roy needed to make Disneyland a reality. "That an artifact like this, which is so deeply rooted in the creation of Disneyland, still exists today is astonishing," Van Eaton co-owner Mike Van Eaton said. "With the discovery of this piece, we have an item that Walt Disney created during a 48 hour period of hard work and imaginative genius, which succeeded in getting him the funding he needed to build one of the most successful endeavors of his career, and which he continued to personally use throughout the entire building stages of Disneyland." The map has never been offered at an auction or viewed by the public in more than 60 years. It was created when Walt spent two days narrating each detail of the park he could imagine, and film artist Herb Ryman turned these ideas into the first large, tangible, visual representation of Disneyland ever created. The drawing was first used to create a tri-fold presentation board that Roy could use for presentations to banks and television networks in New York. In September of 1954, one year after the map was created, a newly-enhanced version of the original image was shown to the public as the first-ever visual representation of the park. In March 1955, during one of the final planning meetings for Disneyland, Grenade Curran, a young Disney employee, discovered the map in the corner of Walt's office and asked if he could keep it as a memento. Walt had befriended Curran and his parents during his time at the Walt Disney Studio, so he agreed. Curran, understanding the importance of the map, stored it away, unaware that he was preserving one of the most significant artifacts in Disney history. 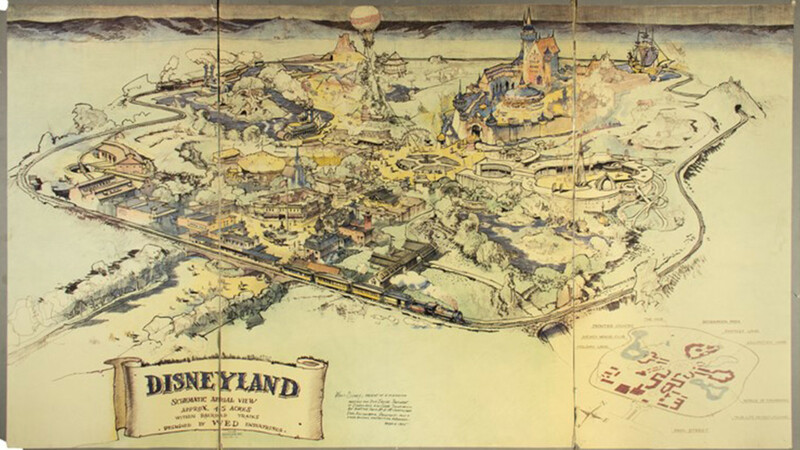 "Without this map, there would likely not be a Disneyland today," Van Eaton said. "We're very excited to be bringing this item to auction and to have the chance to share the story behind this map with the millions of people who love Disneyland just as Walt originally wanted." The 800-item auction featuring other original Disneyland props, costumes, souvenirs, and artifacts will take place June 2017, with an exhibition in May where the public can view the items in person.